The Japanese concept of Shibui is a fascination of ultimate beauty. Honorable wear in normal care and use imparts an aura that is the ultimate in desirability. To experience a well preserved work of art (Sword/ Tsuba) that has seen honest wear and use (for which it was intended) and to be able to place it within a recognizable frame of reference is to me the ultimate in collecting. Continually updated, please check often. purchased together for the cost of $230.00 plus postage. Robert E. (Eugene) Haynes was born October 28, 1930, in Los Angeles, Calif. The only child of Robert E. Haynes and Dorothy Holmes Haynes, both only children. At age 5 he was sent to Flintridge Prep. School near Pasadena, Calif. At age 7 he went to the Calif. Prep School at Ohai, Calif., to the age of 13. The family moved to Santa Cruz, Calif. and Robert then went to the Menlo School at Menlo, Calif. (near Stanford Univ.). At age 15 his father died and he moved with his mother to Pasadena, Calif., for one more year at Flintridge Prep., and his last year of high school at John Muir High School and Junior College in Pasadena. Since his father was both artist and engineer, he drew and designed from an early age. At age 16, in Pasadena, he became an art student, in oil painting and drawing, with Paul Coze. At age 15 (1945) he bought his first tsuba (Japanese sword guard), which began his interest in Japanese art over the next 59 years. At age 20 he went to Korea and was with the 1st Field Artillery Observation Battalion, for a year. He had five days R & R from Korea, and went to Kyoto, where he bought many sword fittings and other Japanese art. To end his army time he was sent to Desert Rock, Las Vegas, for atomic tests, and saw 8 atomic bombs tested. In 1952 he was accepted at the Slade School of Fine Art, Univ. of London. By this time he had been collecting Japanese sword fittings for ten years. 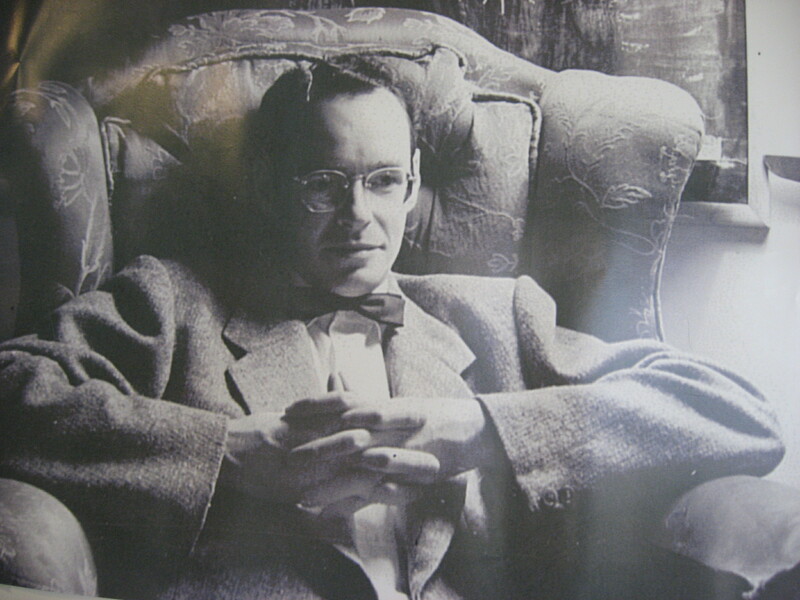 In London he met W.W. Winkworth, at Sotheby's Auction House, and B.W. Robinson, at the V & A Museum, both of these venerables became his good friend. After a year at the Slade, and having won the student prize in oil painting, he returned to the U.S. He became a student at U.C.L.A. and was very fortunate to have had the late John Rosenfield as his teacher of Japanese Art 1A. After graduation from U.C.L.A. 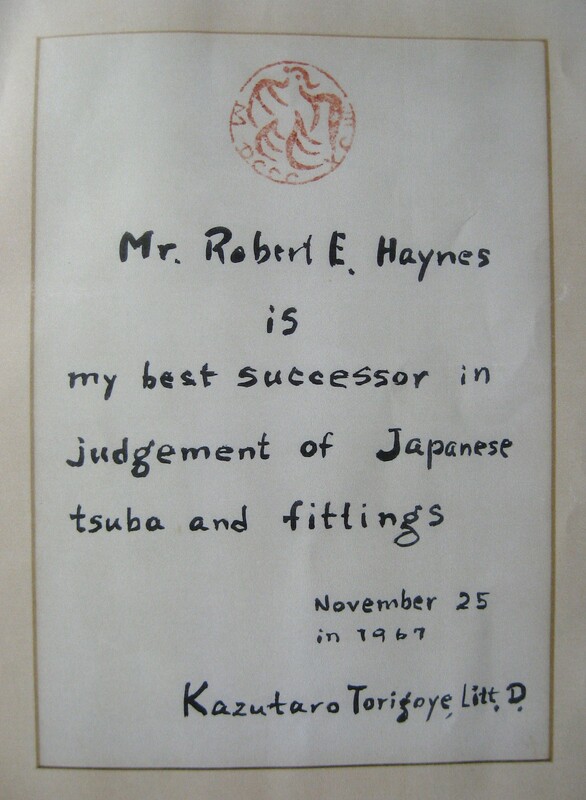 he went to Okayama Japan, in 1960, at the urging of John Yumoto, his first teacher in sword fittings, to study sword fittings with Dr. Kazutaro Torigoye, who was the last student of Akiyama Kyusaku (1844-1936), and the leading expert of his day. 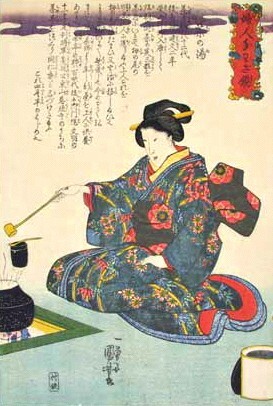 Akiyama was the founder of the study of sword fittings and kodogu. After a years study he went with Dr. Torigoye to Tokyo and was able to view many of the most important fittings in Japan, both in museums and in private collections. 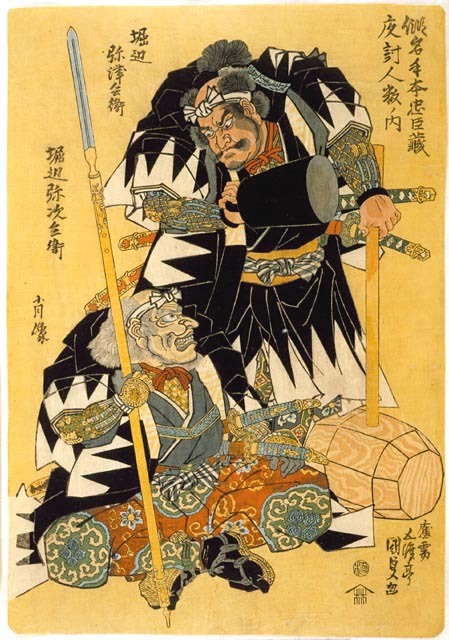 After his return to the U.S. he helped found the various Japanese sword clubs that function to this day. In 1963 he returned to Europe, and in London, was introduced to Neil Davey by Billy Winkworth, at Sotheby's, and Neil, he is proud to say, has been his friend these many years. In 1971 he returned to Japan, at the invitation of John Harding who had formed the London Gallery in Tokyo with Tajima-san. In these six months he saw numerous collections of fittings and added greatly to his own collection. By this time he had moved to San Francisco and became the oriental art expert at Butterfield & Butterfield Auction House, where he wrote several auction catalogs devoted to swords and fittings. In 1980 he wrote the first major Japanese sword and fittings auction catalog for Christie's in New York. 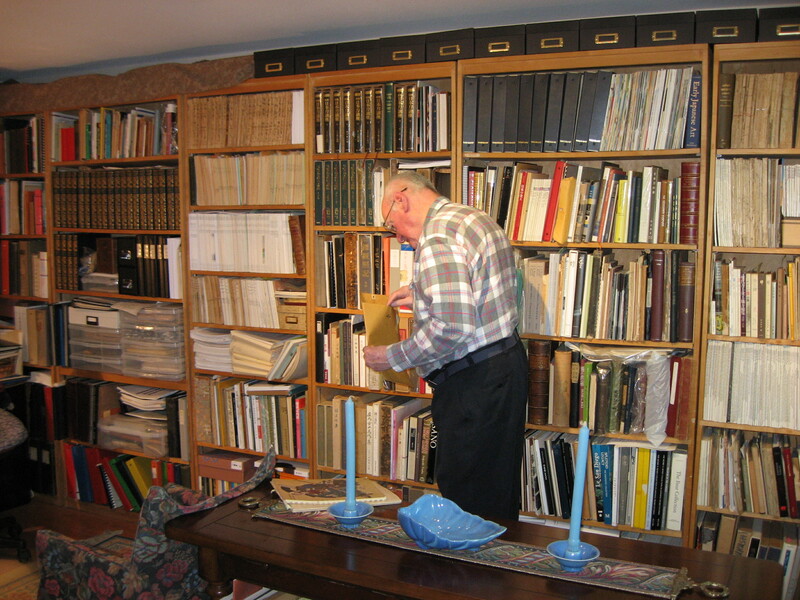 In 1981 he formed Robert E. Haynes Ltd. and wrote the 10 volume set of auction catalogues (1981-1984) that held thousands of impotant swords and fittings (regarded as essential to the collecting of tosogu) that were auctioned over a three and a half year period. He has written many articles on sword fittings and related Japanese art and in 2001 completed his impressive publication of the 3 volume set called “The Index of Japanese Sword Fittings and Associated Artists”, the most comprehensive documentation of artists in the field of Japanese sword decoration to date, containing 12,560 listings of documented tosogu artisans and now including the 'Corrigenda Et Addenda' (2011). Since this time he has studied this area of Japanese craftwork like almost no other expert and carried out research which goes far beyond the usual activity of a collector. Thousands of objects went through his hands, and even today he still continues to record everything that appears to be of importance with regards to this subject. 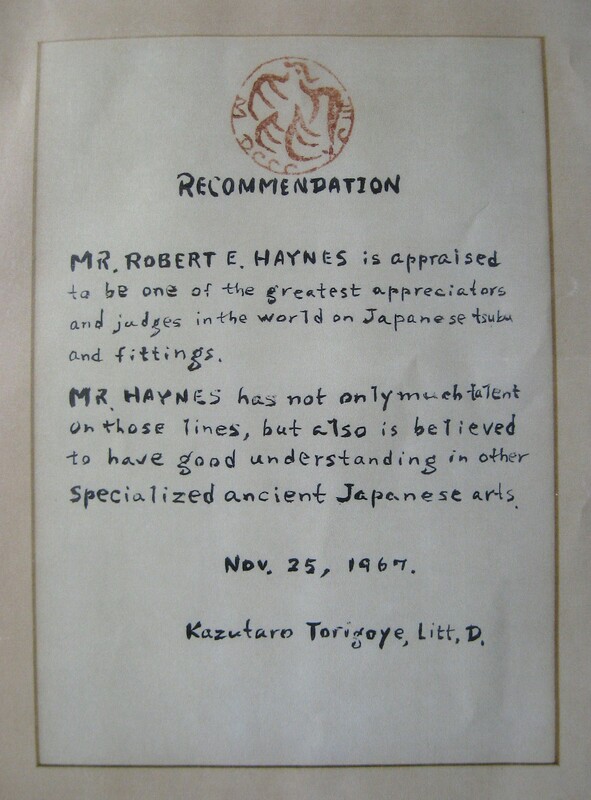 Robert E. Haynes was presented both this diploma upon completion of his studies with Dr. Torigoye and this certificate of recommendation by Dr. Torigoye. 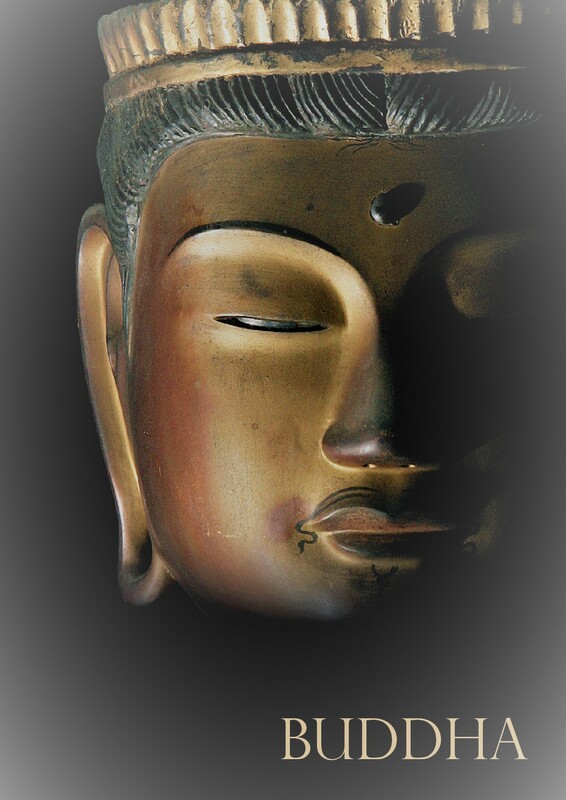 is a meditative ritual involving a group of participants and a gathering of objects, the ultimate purpose of which is to reveal the profound sacredness at the foundation of the everyday acts of our lives: of eating, drinking, moving and interacting with people and objects. It is a lesson in the art of living fully and deeply, experiencing and gratefully appreciating the everyday miracles of existence. 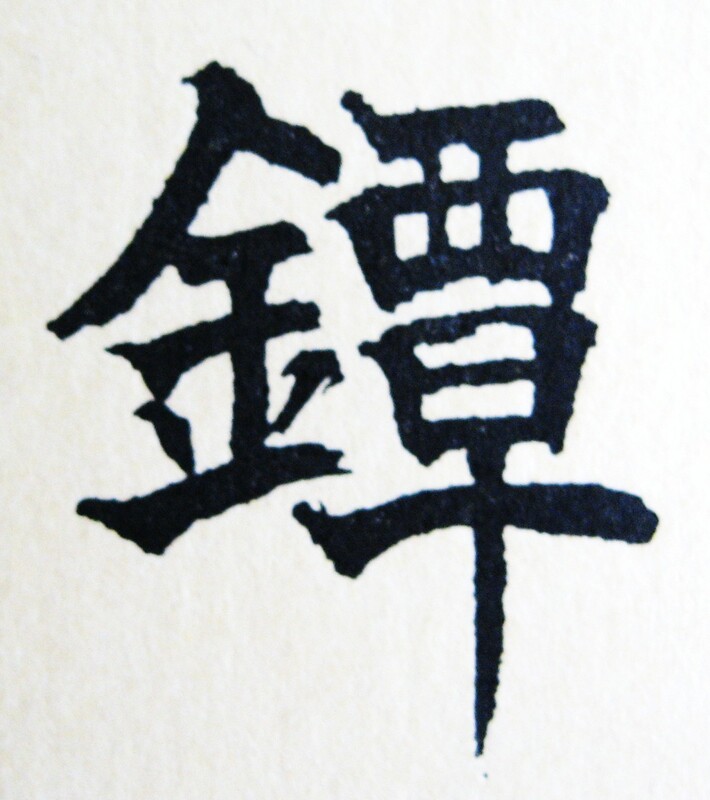 Articles, papers, essay's and descriptions of Nihon-to, Tsuba, and other subjects are included in the Study Guide along with other educational web-sites. Study, as I have, the great Unifier's of Japan. Laura Long, a professional seamstress, makes all of the Handmade Fabric Items offered on this website. These include Sword bags, Tsuba bags (holds one or many), and Japanese GI's. All STANDS are "On Sale"
"It is said that true beauty is to be found when a person completes in his or her own mind that which is incomplete". "When one considers that action is an expression of spirit, then the way to bring one's actions to a peak of perfection is to refine the heart that lies within". It is with both pride and humility, my fond hope that this web-site may prove as stimulating to the viewer as it's production was to me, especially when I studied the multiform landscape of an ancient culture and the often tragic but brave attempts of its subjects to cope with the demands of a harsh reality. Confronted as we are today with social and political turbulence, living under the moment-to-moment threat of catastrophe, all studies of man's experience in the art of violent confrontation have acquired a particular relevancy. Almost everyone seems to agree that we must attempt to determine whether man will be forever trapped by his apparently constitutional inclination to employ any method, however lethal, to ensure his dominance over his fellow man, or whether he may be capable of ritualizing and then ultimately, transforming that pattern. In this endeavor, thoughtful studies of man's past, with all its pitfalls and bloody errors, may prove to be a necessary and valuable factor in the final equation.